At a Senate hearing, the CEOs will be pressed to explain why gasoline prices are so high — they average nearly $4 in most places and have topped $5 a gallon in few cities. Democrats are also planning to pressure the companies to renounce long-standing government subsidies totaling billions of dollars a year. Expected to appear are the chiefs of ExxonMobil Corp., Chevron Corp., BP PLC, Royal Dutch Shell, and ConocoPhillips. The CEOs of the same five companies appeared at a similar congressional hearing in 2008 when gasoline prices soared. Congress wants the oil companies to defend their tax breaks. I have written about these tax breaks recently, and some of the responses to that essay were amazing. There are certainly a number of people — in fact maybe even the majority — who believe that we can take money from the oil companies and move it into the tax coffers, and the only consequence will be moving money from A to B. These people never consider that the response from the oil industry may be undesirable with respect to future tax revenues (what Hugo Chavez has done in Venezuela is a perfect example), and therefore eliminating a $1 billion tax deduction may not actually generate $1 billion of revenue. In fact, it might not generate any new revenue. The goal of tax policy should be to maximize tax revenues, but that means carefully considering the impact of changing the tax code. For instance, I think most people would agree that increasing taxes on oil companies to 100% of their income would result in zero revenue, as the oil companies would simply go out of business or move their operations overseas. Setting the tax rate at 0% would be great for the oil companies, but then the government revenues would again be zero. Somewhere in between, the tax code is supposed to maximize the government revenue. The politicians with their eyes on these tax breaks only see higher revenues, while those defending the tax breaks argue that the impact may be higher gas prices and loss of jobs. There is also apparently a large category of people who think that 1). Oil companies pay little in taxes, and/or 2). The reason for record oil company profits is the tax breaks they enjoy. In fact, I read a recent essay that claimed that ExxonMobil paid federal taxes at the paltry rate of 2.3%. (That link has gone dead; my guess is that ExxonMobil threatened to sue him for spreading blatantly false information). ExxonMobil, on the other hand, claims that they are one of the largest taxpayers in the U.S., and that their overall tax rate is 47%. So there would seem to be a vast disconnect between what ExxonMobil claims they pay, and what people think they pay. 1. It was widely reported that ExxonMobil paid no U.S. income taxes for the 2009 U.S. tax year. Reportedly this was because ExxonMobil overpaid taxes in 2008. Could you break down the taxes in the form of U.S. income taxes paid versus U.S. income for the past five years? That way we can get an idea of the average tax rate over time. 2. A website called http://tax-evasion.org/ named ExxonMobil #2 on their list of companies that avoided paying taxes. GE was #1. They reported that ExxonMobil paid $1.27 billion in 2010 in federal income tax. They reported that as a tax rate of 2.3% (not sure how they came up with that number given an income that I believe was $30.46 billion). I presume they are looking at U.S. income taxes, but global income, but can you comment on their claim (found in full at Who’s #2 in Tax Avoidance? How About Exxon – This is the aforementioned link that is now dead). 3. Can you break down U.S. income versus total income for the past five years? 4. Can you categorize the kinds of taxes you have to pay that other industries don’t pay? 5. How does your net U.S. income tax rate compare to that of other Fortune 500 industries? They answered most of my questions during the call, and I want to excerpt the answers below. If you are interested in seeing the transcript for the entire call, it can be found here. I won’t offer any specific commentary on their answers right now; I will just present them as they gave them. Speaking for ExxonMobil were Ken Cohen, Vice President of Public and Governmental Affairs, and Jaime Spellings, Vice President and General Tax Counsel. 10:32 MR. COHEN: This is Ken. Thanks, Jaime. Let me add to that, too, just to get us back onto the bigger picture of – you know, we see a lot of reporting that makes the false claim that the industry and our company, in particular, aren’t paying the fair – our fair share of taxes, and that’s just false. You know, let’s just look, for example – I’ll give you first the – let’s look at the first quarter of this past year, and then let’s take a historical look. We just announced our first-quarter earnings. And we did make – we made $10.7 billion in the first quarter of this year. That 10.7 billion (dollars) was on revenues of 114 billion (dollars). And on that 114 billion (dollars), our total expenses were 77 billion (dollars) excluding taxes and duties. And then, we paid government taxes and duties around the world of 28 billion (dollars), leaving the $10.7 billion of earnings for the quarter – so that – I’ll go back to that tax bill: 28.2 billion (dollars) on a global basis. Now, if you – what we always need to do is focus on the U.S. part of our business because I said at the beginning that 75 percent of our earnings come from outside the U.S. In the first quarter, we made $2.6 billion in the U.S., and our U.S. tax burden for that quarter was $3.1 billion. Now, let’s put that in a broader perspective. If we go back and look at the period 2005 to 2010 and look at the United States, our income before taxes was 67 billion (dollars), and our income taxes for that same period – that includes federal and state income taxes – were $22 billion, for an effective tax rate of over 32 percent. So those are the facts. 34:55 MS. VAN RYAN: Let me interject a question here, because we’ve talked about the numbers to a great degree here today, but I guess the basic question is, so what do you say to people who claim that ExxonMobil is number two on a list of companies that absolutely isn’t paying taxes this year, with G.E. being number one? And there’s a website online that alleges that, and I did have a blogger send in a question about that. What do you say, Ken? 35:22 MR. COHEN: Liar, liar, pants on fire. (Laughter.) It’s just not true. You know? I– we’ve – the blog I do points that out. We’ve put the numbers out. It’s just – I don’t know what it is, but it’s just something that is irresistible to whale away on this topic with – you know, the inconvenient truth here is that we are a very large taxpayer. And I’ve given you the numbers on what our – over the last five years, what our U.S. income taxes were versus our U.S. earnings, and I – the effective tax rate during that period in the United States was 32.4 percent during that period. Those are the facts. 38:07 MR. COHEN: Yeah. And to finish that, Jaime, if we did not have the adjustment for those pre-2000 – year 2000 returns, on the tax exposure of 500 million (dollars), that would have been for that year, in that down period, an effective tax rate of 19 percent. Over 19 percent. So even in that year, that would have been the tax exposure. 24:35 LEW WATERS: Hi, Jane. Lew Waters here. I’d like to get a clarification going back to earnings, and taxes being higher than earnings. In their blog post on this on Perspectives, it also says that during the quarter, we made about 9 cents for every dollar of sales. Now, is that 9 cents after expenses, before taxes, or just – how does that work out? 25:00 MR. COHEN: That’s at the end of the day, after all expenses. Yeah, you know,our total return as a business, our margin, profit margin, is 9 percent. Little over nine. But the round figure is 9 percent. 25:10 MR. WATERS: That’s after taxes? 25:16 MR. COHEN: That’s our profit. And then you have to put that profit margin in comparison with other large Fortune 100 companies, and that profit margin puts us right in the middle. And I think what attracts attention is that our business is very large. There were some other comments in the call that touch upon some of the recent subsidy discussions we have had here. I will excerpt some of those as well. 04:18 JAIME SPELLINGS: If you look at the structure of 199, it has a general provision that applies to all manufacturing, including farming, mining, fishing, video game development, Hollywood movie production. And so it has a very general provision. And inside that general provision, oil and gas obviously qualifies as an extraction activity. There is a provision much later in the details of Section 199 that for oil and gas only –this is the only activity that’s singled out in Section 199 – it actually reduces the value of the manufacturing deduction by a third. So if everyone else gets a 9-percent manufacturing deduction, we get a 6-percent manufacturing deduction.And one of the proposals that’s currently being talked about on the Hill – this was the press release from Senator Baucus – would take away the 199 deduction entirely for just five companies. So now 199 already discriminates against oil and gas compared to all other industrial activities. The proposal currently being floated on the Hill in the Senate Finance Committee is to further discriminate against five companies only in the oil and gas business. Percentage depletion says that if you’re in the extraction business and you have gross income of a hundred dollars, you get to take a fixed percentage of that production as a(n) expense on your tax return, or as a deduction on your tax return. That is a preference because it is a(n) expense or deduction you get to take that’s not related to your actual cost; it’s related to your revenue. This is something that’s been in the code since the very beginning. It applies to all extraction activity in the U.S. So coal, steel, iron, copper, silver, gold, anything that you’re pulling out of the ground – peat moss, clamshells, caliche – anything that you’re pulling out of the code, you get to take percentage depletion. Now, within that framework, oil and gas is the only mineral that has a listed deduction for percentage depletion. And oil and gas is limited to a thousand barrels a day. So if you work out the math, and you take a thousand barrels a day, even at $100 a barrel of crude, the maximum value for any taxpayer is between 1 (million dollars) and $2 million a year from percentage depletion. And again, oil and gas is the only one that’s limited. You can get a coal percentage depletion that’s, you know, worth a hundred million dollars a year, but you’re never going to get an oil and gas percentage depletion deduction that’s more than 1.5 million (dollars). Now, I saved the best for last: Since 1975, large, integrated oil and gas companies get no percentage depletion – zero, none. So when we purchased XTO in last summer, XTO was getting percentage depletion out of that thousand barrels a day of oil production. The minute they joined the XTO – sorry, the minute XTO joined the Exxon Mobil group, they immediately lost their percentage depletion deduction. So go back to the big picture: Oil and gas has less favorable rules than other similar industrial activities, and large, integrated producers like ExxonMobil actually have less favorable treatment than the rest of the oil and gas industry. 15:58 MR. COHEN: In fact, you know, it’s interesting – we were – I just looked at that over the last couple of days. This proposal doesn’t hit – if you’re looking at the top five, for example, retailers, I don’t think many of you would realize that Walmart is one of the – now in the top-five retailers of gasoline in the United States. Marathon is not included in the list; they also are one of the top retailers.If you look on the refining side, Valero and Marathon are not included in these tax proposals. And I don’t say that to have the arm and the – of the federal government reach out to touch these other companies, I mention that to show the whimsy of this particular proposal. If you look in the state of – at Baucus’ home state, we have a refinery that would be impacted, and a competitor’s refinery across the street would not be impacted. And that means that our workers in our refinery in Senator Baucus’ home state will be at risk because that refinery becomes less competitive. And then, we have the interesting situation in Chalmette where the Venezuelans would not be subject to the same provisions that would be applied to our operations in Louisiana. On the natural gas side, of the top-five producers of natural gas, only two would be impacted by this proposal. The other three top producers of natural gas would not, meaning that two of the producers of natural gas, which is going to be the future for electricity generation, going to be producing electricity with a lower CO2 input, be cleaner energy – but you’re putting at a disadvantage two of the top producers, and giving your cost advantage to three of the top five. 20:36 MR. COHEN: The thing that is the reality here, number one, is of course the challenge of talking about a business with such large numbers. If you’re a refiner, you’re caught between two huge numbers in the current environment. One big number is the price of crude oil. And for a large refiner buying a lot of crude oil, that is a big cost at the front end. And then the other big number is the cost of running a large, complex refinery. These areas sophisticated and as complex a manufacturing operation as one could find anywhere in the world, subject to extensive government regulations and controls. So those two – between those two costs, your cost of the – of acquiring the raw material, and the cost of keeping the doors open, for ExxonMobil, it costs us a billion dollars a day to keep our doors open. So this is a very tough business. It is a low-margin business. We made – in 2010, on average, we were keeping about 3 cents a gallon, comparing – that is, that returned to ExxonMobil from the sale of a gallon of gasoline, whereas the federal government by statute was keeping 18.4 cents a gallon on every gallon sold. And then, the state governments – the range varies, of course, depending upon the state. But if you’re in a state like New York or a state like California, the total tax take is in excess of 60 cents a gallon. I’m just – I don’t – I just point those numbers out. In the first quarter of 2011, I believe we were keeping 7 cents a gallon. That was our profit on a gallon of gasoline. So there you have ExxonMobil’s answers to questions about their earnings and taxes, and likely a preview of what you will see at the Senate hearing (likely fodder for a future blog). Now if they make 75% of their earnings outside the USA, will removing the tax breaks cause Exxon to leave the United States forever? Will the small businesses and small producers be hurt by removing the tax breaks to domestically produce oil and natural gas if they produce 100% of their earnings in the United States, and not 75% of their earnings outside the United States? I believe Exxon will not be grossly harmed, but the rest of American industry will be harmed…and this is exactly what some bloggers and political forces want to see is American oil & gas production industry slowely elminated entirely. It is a short sighted vision, but one that is very profitable in certain circles of influence. Very interesting. If this is true, this sure makes things crystal clear. It seems integrated oil & gas companies do not receive this depletion allowance. I would like to know more about this issue. Fortunately, Exxon makes 75% of its earnings outside the USA so again I think that neither issue of tax breaks is/will effect them. We then ultimately recover those costs, if you will, if we’re able to, from the marketplace. And in the downstream part of our business, which is refining and marketing of the products we make, in the U.S., that has not been a profitable business over the last five years. In fact, the last – well, excuse me – over the last five quarters, we’ve only made money in one of those quarters in the last five, if I’m looking at the number right. And in the first quarter of 2010, total downstream – I believe we reported a loss for our downstream, total downstream operations. Ok, I just need to know if any of their trading profits are offshore. They mention their “refining and marketing” as their combined downstream group that has lost money in nearly every quarter. Yet, anyone who does taxes tries to reduce their tax burden legally. I just wonder if there is any earnings from “trading” offshore that is profitable, while in the USA, the “marketing” downstream business is losing money. All evidence is pointing to speculation and trading of hedge funds and naked short selling as the real money makers. I wonder if Exxon has their own hedge funds overseas. It would be nice if a requirement for being a candidate for elected office was to understand the Laffer curve. This was pointed out here – at 100% taxes, revenue is zero because they go out of business, at 0%, it is zero because nothing is collected. Somewhere in between is a maximum – at any % rate above that, raising the rate reduces the revenue. I have successfully explained this to elementary school kids, with the help of a graph. For a long time I have wished the D-Party would start looking at business as a friend and ally, and not as an adversary. We get our wealth and income from the private sector, including oil companies. (BTW, I have also wished the GOP would take a gimlet eye to military outlays and stop hating school teachers). Oil companies want to make money–and they should. They are publicly held corporations. Oil is much more controlled by thug states, than any private players. That said, we should probably have a much stiffer national gasoline tax. Is this something that might have an impact on energy costs in the future? It would be nice if a requirement for being a candidate for elected office was to understand the Laffer curve. This part was a great way for a journalist to show he understands nothing very technical: Genomic sequencing costs have dropped by 99.96% since July 2007, encouraging genetics-based technology that could displace coal and gas-fired generation. But before such novel tools reach scale, oil producers are already signaling they recognize the competitive threats from technology and policy: Europe’s third-largest oil producer last week announced its intention to acquire a majority stake in the second-largest US solar panel maker. Let’s see: lower costs for genomic sequencing will make solar panels more competitive? What planet would that be on? Then there is this: That fall in genomic sequencing costs may allow otherwise slow moving developments like algae fuel to speed up. Between lower cost for sequencing and lower priced algal fuel there are several tough yards of product development. Sequencing cost is not the main issue holding up algal fuels. I’d say it was one of the least relevant issues. 1. Sunlight at ~1 kW/m^2 is diffuse. Even if you could collect it at high efficiency, you’re going to need a large area to make a dent. 2. Outside the open ocean it will never make sense: the ponds get so large that evaporation will lead to humangous demand for water. Seen any reasonable proposals for an open ocean based system yet? If it has hardly been proposed, it’s probably 20 years away, at the soonest. Finally, our friend Greg did arrive at some common sense, but perhaps it was by accident: Aurora Algae, once called Aurora Biofuels, last year switched gears away from diesel replacement to food products, including animal protein, feed, and Omega 3 oils. If you were able to grow algae very cheaply, there are a lot of markets where you could make a lot of money. Algal fuel is likely to be the most difficult place to make your money, even at $100/bbl. I would like to know the answer to that as well, as I understand the vast majority of US production is from very small stripper wells. My electric bill keeps growing and growing and growing, but not a peep from anyone about investigating the coal companies. How funny is that?! In its 2006 annual report on US reserves, the EIA published a tabulation of production by operator size class. From this we can get an idea of the collateral damage to independent companies sustained in the fed’s quest to punish big oil companies. US domestic crude oil production was 5,102,000 barrels of oil per day in 2006. The top 10 companies produced 49.7%, or 2.54 mm bopd, for an average of 254,000 bopd for the top 10 companies. Companies ranked 11-20 (10.3% of US production) averaged 52,550 bopd. Companies ranked 21-100 (18.7% of US production) averaged 11,925 bopd. Companies ranked 101-500 (10.5% of US production) averaged 1,339 bopd. The remaining 13,320 companies (10.8% of US production) averaged 41 bopd. Since for each size class, average daily production is for the entire company, and each of these companies will likely have quite a few wells. it’s safe to say that most of the pain of Big Oil’s tax flogging will fall on these little guys producing on average a few barrels per day per well. You can also get a sense of this by, for example, looking at the State of California’s annual production reports. For 2008 (the latest one, believe it or not), the state produced 238.6 million barrels of oil from 52,540 wells, for an average of 12 bopd per well in the state. About 59% of these wells are classified as stripper wells (<15 bopd) and these account for 17% of the state’s production, or… 3.6 bopd per well on average. A similar exercise for Texas shows that the average well in that state produced just under 6 bopd in 2009. The top 32 producers in Texas produced 62% of its oil that year, meaning that the remaining 7,586 companies operating in the state produced 38% of its oil (359,000 bopd), for an average of 47 barrels per day per company. I think there’s too much focus in this debate on what the tax would do to Exxon et al, or whether companies will go out of business if taxes are increased. The real question should be – what is the incremental impact on production and jobs going to be? With higher costs, at least some of these wells would have to be shut in, and some people let go, whether the company goes under or not. The collective result might not be trivial, but our esteemed politicians seem to ignore small businesses and the notion of marginal impact in their obsession with sticking it to Big Oil. as I understand the vast majority of US production is from very small stripper wells. Well, not quite. 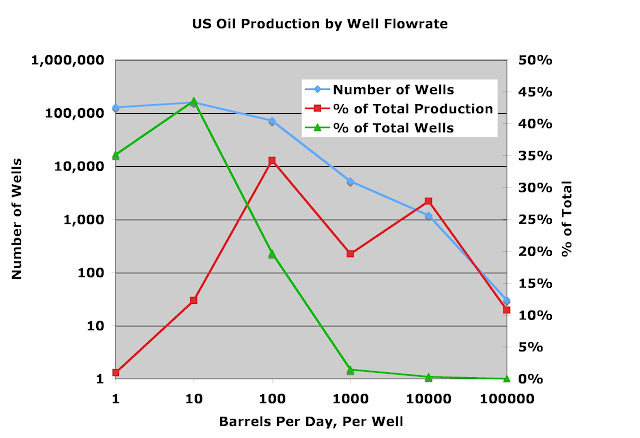 The vast majority of wells are low production stripper wells, but not their share of production. Amazing that are over 100,000 wells producing less than a barrel per day. The “stripper wells, classed as <15bpd, together account for 310,000 wells (85% of all the wells) and 19% of all US production. The total of all the wells under 100bpd, are 47% of US production. Most of these wells will be owned by independent producers. I have not charted gas wells, but there are over 460,000 of them, and those producing under 15 barrels of oil equivalent, account for 338,000 of them, and 12.2% of total production. If you were a Big Oil Company, and these were your wells, what are the chances of the company accountant pointing out that 81% of the production comes from 15% of the wells, and the remaining 85% of wells that produce just 19% of production, simply aren’t worth the trouble? It is a textbook illustration of Pareto’s 80/20 principle. And, if you look at the well/production stats for any of the National Oil Companies that release that data, you will see that they have far fewer wells – when the flow declines below a certain point, they are shut down. IN the US, when they get to that point, they are sold to someone else – an independent- who can operate them profitably. They go down the value chain just like used cars. I think it’s quite likely that the depletion allowance and the intangible drilling costs credit play a part in this – as the depletion allowance only benefits small companies and the drilling credit encourages all companies to drill marginal wells that they might otherwise not. The US domestic petroleum industry is an amazing small business success story – there is no other country in the world that has as many independent producers as the US. In fact, the US probably has more producers than the rest of the world combined. This is distributed energy production at it’s best – wells that are just to low production for a company, are just fine for a mom and pop operation – and many are just that. So, the independent oil co’s are, collectively, are major producers, major employers, and (likely) major taxpayers too. In this rush to cut down the tall poppies, it is likely the whole field will be trimmed, and that can hardly be a good thing for keeping domestic production up, nor prices down. These well-to-wheel carbon tax calculations is something we have been working on for a couple years in our gas flaring reduction methodology. The source of the carbon will be as much an issue when these taxes are implemented globally. It will impact costs of energy. The other major issue will be Wall Street untouchables and their ability to use the markets to legislate policy and consumer behavior. Since we are on the subject of taxes…and the congressional hearings in DC this week on “Big Oil”…why does the press ignore this? Although I admit to be totally biased and in favor of the oil & gas industry…since I’ve worked in it during good and bad times starting in 1990…I can say more and more is pointing back to Wall Street as the core problem of this nation. I know currently the media has gone crazy over the issue of gasoline prices, crude oil prices, natural gas fracking disasters, etc., but just think how many stories you hear against Goldman Sachs? Is my being bias toward the oil & gas industry the reason I’m so frustrated with Goldman Sachs and the other untouchables? I don’t think so. Federal and state governments “profit” more from each gallon of gasoline sold than does the oil company that sells it. For those who don’t have time to read the article on Goldman…here is just one reason why we should not support those who are the untouchables. And this is only one example…the whole story is like something out of Hollywood…where in the end they go to jail. On Wall Street, however, they will all go to the Hampton’s laughing at the American people and the bloggers who refuse to disclose this information publicly. You can bet with a near 100% certainity the continued articles by Rolling Stones on Goldman and other Wall Street untouchables will cost them in the end, and the next “economic blow-up” will wash all these investigations under the rug. companies, said Senator Charles Schumer, a New York Democrat. adverse impact” on the industry. And to think the politicians are not confused…I think it is called bribery, corruption and evil…but those are only words that can be used explaining foreign politicans that oppose Americans. It is really very sad. Sadly, many people actually believe that. Since taxation is a form of slavery, the only morally-defensible goal of tax policy is to minimize the burden on the taxpayer. Crime is doing what is illegal — true crime is what is legal. I will say this about oil deductions, corporate taxes etc. Corporate income taxes have been decreasing as a fraction of total federal revenues for decades. Any tax that requires teams of accountants and lawyers to “interpret” is inherently unfair. Ergo, forget taxing corporations, and move to gasoline and consumption taxes. If you wish for progressivity, then do not tax food and medical care. What feudal society do you live in Tom? There was a time we plowed fields without oil. The effort of a freeman or a slave was the same. However, I think the latter would have enjoyed the freedom to pay taxes. Energy provides freedom from being a beast of burden (so we have more time to drive to a gym, run on a treadmill while watching CNN). I am very happy with big oil and big electricity. I get a lot of benefit for a small cost. Energy is the cheapest of communities. I am very happy with my small local government since I no longer live in California. Low property taxes and good services like schools. I am less happy with the bigger state government but once again it is hard to complain since I no longer live in California. We do have a good highway system. Then there is the big federal government. I am happy with the uniformity of laws and national defense. Living in the least corrupt with the most dominate military power is chance of birth and worth every penny in taxes. The problem I have is that some have been in congress so long that they think of those who produce things like energy as evil and corrupt. It is only fair that we should be punished for being productive. Taking less money is called a tax break while giving money to those who pay no taxes is called an ‘earned’ income credit. So what have the feds done for me lately? They made my electricity bill $20 larger without making my clean air any cleaner. This is just an example of government declaring war on energy. When energy becomes more expensive, jobs that depend on energy, go to China or India. With high unemployment, EPA wants to regulate ghg by sending jobs to places with no incentive to reduce coal use. When Americans work rigs in the US, they produce oil and natural gas. They pay taxes too. I can not see anything to be gained by driving energy production to other places. I have heard of the Laffer curve, but didn’t realize that was what I was describing. “…enjoyed the freedom to pay taxes.” Thanks, Kit. What a wonderfully Orwellian phrase. This chart was actually published by the Wall Street Journal in 2007, so therfore it Must Be True, but this looks like a pretty awful exercise at curve fitting, and this economist (which is where I found the chart) gives a good discussion of this. Remove Norway as an outlier and you just have scattered data set Even similar economies, like Canada and Australia, have very different results. There is a general trend of increasing revenue with increasing tax rate - but then the tax rates stop at 35%. Probably somewhere not far past this is the point where companies that can relocate, do. The chart does show, however, one reason why Halliburton might choose to relocate to Dubai. I am less happy with the bigger state government but once again it is hard to complain since I no longer live in California….The problem I have is that some have been in congress so long that they think of those who produce things like energy as evil and corrupt. Those two statements appear contradictory, Kit. CA has term limits. It does no good that I can tell, or is there something you can point out? As far as I can tell, term limits make the revolving door much more of an issue. Also, politicians, even those from the so-called “small government” party, find ways to stay on the state’s payroll, even after their terms officially end. Seems like these days the prostitutians learn the tricks of the trade quite fast…. You may be correct. Time in office may have nothing to do with the lack of respect for how tax dollars are produced or how they use it. Term limits has not come into effect before I left California. I suppose term limits does not apply to the US House and Senate. Term limits may even make the problem worse – as the pol’s have only a limited time to spend as much money on their pet projects as possible. And since the main measure of a pol’s success these days seems to be how much government largesse they can divert to their district, I suspect that may be the case. But what I mean by that is that by taxing in such a way that businesses and individuals are allowed to prosper, tax revenues will be maximized. So that means a lower burden on tax payers. IN the US, when they get to that point, they are sold to someone else – an independent- who can operate them profitably. They go down the value chain just like used cars. Very interesting. Thank you for the very thorough reply Paul. OD – there is one qualifier I should add to that statement you highlighted. And that is for offshore wells. Once the flowrate coming out is less than the operating cost of the platform – the well is abandoned. And given the costs of operating offshore, that flowrate could still be quite high – there are no stripper wells for offshore. This is one of the reasons why offshore fields deplete faster – there is more oil left in the ground that is technically recoverable, but not economically recoverable. Perhaps the following questions are answered somewhere in the huge amount of information you supplied, or on one of the links, but I am asking them in the hope that you can save me from digging. My basic question is, when Exxon Mobile (or any other oil company) talks about “taxes”, what are they counting? Are they counting royalties on oil and gas extracted from public lands and offshore? If so, then there is no rational reason why the rate of government revenue take should be similar to the normal rate of income tax. Indeed, to the extent that extraction activities give rise to pure resource rents, the optimal royalty may be quite high as a share of gross revenues. In Norway, for example (where all production is offshore), the effective royalty rate is around 75%. Are they counting the high, special “income tax” rates charged by many foreign (especially Middle East and North African) countries in which they operate as taxes, rather than what a good chunk of those taxes are in everything but name: royalties. Are they counting the excise and sales taxes charged on retail sales of prtroleum products? If so, then again they are inflating the “tax take”, as those taxes do not affect their bottom line: they are only acting as tax collectors for the government. Our politicians are enough to make a sane man weep. The Democrats fight domestic drilling, especially ANWR, with a vengeance, while the Republicans do all they can to destroy biofuels. Meanwhile, we pay $4.00/gal for gasoline. It’s enough to make you want to pull your hair out. Our Corporate Tax System is completely bonkers. First, our Corporate Taxes are way too high; but, then, they allow taxes to be transferred to Overseas Subsidiaries, and held there, forever, uncollected, until those “profits” are brought back home. It’s nuts. It ties up Incredible amount of investment money in every country around the world Except the U.S.
And, yes, when Exxon talks about 41% “Income Taxes” it works this way. Foreign Governments have changed the term “Royalty” to “Income Tax.” This is important because “Royalties” are just a “Cost of doing business” like drill bits, pipe, etc. However, “Income Taxes” paid to a foreign government can be deducted from Income taxes owed in the U.S.
For instance, there would be NO U.S. Income Tax owed on profits made in a foreign country that had a 75% “Income Tax,” but the U.S. income taxes could be very large on profits made in a country with a 75% “Royalty” on oil produced. You know, Rufus, I actually agree with a lot in your comment. However, I disagree with your assertion that “the Republicans do all they can to destroy biofuels”. First of all, if you are talking about ending the VEETC, that will not “destroy biofuels”. Indeed, I thought that you already acknowledged that. Second, it was a Republican (Senator Grassley from Iowa) who ensured last December that the VEETC would get extended for another year. And as for $4 per gallon gas. You know what price it is in most of the rest of the industrialized countries of the world, including Turkey, which has a much lower GDP per capita than the United States? More like $6 to $9 per gallon, thanks to much higher taxes. So thank your lucky stars. And nothing — short of cutting the already low federal excise tax on gasoline — that the federal government could do is going to reduce the price in the short term. Inhofe, and the other Fossil fuel-owned Republicans are, basically, trying to completely destroy the biofuels program before Grassley, and a few others, can modify it (to, for instance, protect cellulosic for awhile,) and wind it down in a sensible manner. Most people that haven’t studied it don’t realize the extent to which the U.S. depends upon the creation, and growth of very small businesses to create jobs, and pull us out of recessions. It is enormous. That small business creation, and growth, isn’t happening this time around. In fact, the BLS “Household” Survey that captures very small businesses backslid in the last report, as illustrated by the Unemployment rate jumping back up to 9.0% from 8.8%. There is more than one reason for this, but gasoline prices impact small business very hard. Many (most?) of those countries that have much higher gas prices than the U.S. also have Government-supplied Healthcare, and other entitlements that the U.S. doesn’t provide. What does government-supplied healthcare have to do with this discussion? At the end of the day, somebody pays for healthcare, and in fact the share of healthcare-related costs in GDP are higher in the United States than in any other country in the developed world. Are you suggesting, Rufus, that the lower fuel taxation in the United States can be justified as a redistributional measure? If so, how do you explain Turkey, which has the highest gasoline taxes in the world, and spends less than 6% of its GDP on healthcare, versus over 15% in the United States. We are, already, on the verge of sliding back into recession due to high gasoline prices. Due to high gasoline prices? Got some proof of that? There are many other structural problems weighing down the U.S. economy, not the least of which is the high debt burden of both individuals and the federal and state governments. Higher fuel prices may be contributing to America’s economic woes, but they are not the principal cause. Turkey? I haven’t a clue. Yes, I guess you could say that high income taxes (which tend to be “Progressive”) coupled with Low Gasoline Taxes (which are “Regressive”) would be a “Redistributive” stragegy. As for the “Does High Gas Prices Lead to Recession” question: It is my experience that the two side of this argument are totally entrenched in their beliefs, and Will Not change their minds. It’s pretty much a “Not-worthwhile” debate. First, even if gasoline taxes were regressive, one could alter other taxes at the same time one increased the gasoline tax to leave the overall progressivity of the tax system the same. This is one example of the principle that we should, to the extent possible, separate the issues of efficiency and equality. We should set the gasoline tax at the efficient level to deal with externalities and then use more general taxes and transfers to achieve whatever distribution goals we have. Claims of the regressivity of gasoline taxes typically rely on annual surveys of consumer income and expenditures which show that gasoline expenditures are a larger fraction of income for very low income households than for middle or high-income households. This paper argues that annual expenditure provides a more reliable indicator of household well-being than annual income. It uses data from the Consumer Expenditure Survey to reassess the claim that gasoline taxes are regressive by computing the share of total expenditures which high-spending and low-spending households devote to retail gasoline purchases. This alternative approach shows that low-expenditure households devote a smaller share of their budget to gasoline than do their counterparts in the middle of the expenditure distribution. Although households in the top five percent of the total spending distribution spend less on gasoline than those who are less well off, the share of expenditure devoted to gasoline is much more stable across the population than the ratio of gasoline outlays to current income. The gasoline tax thus appears far less regressive than conventional analyses suggest. I have seen other estimates from other studies that also support this kind of analysis. Generally, the poorest decile of the population takes public transportation or uses other alternatives to the standard model of owning a car and paying for gasoline. And again, I would argue, brining in government-provided health care into the argument is just short of bizzare. I live in Tunica County, Ms. This is a very poor area, and I think gasoline prices impact the citizens pretty hard. Also, if one wishes to go from here to Tupelo, or Yazoo City, there just isn’t much “public transit” available. However, if you say a couple of dollars/gallon added to the gasoline tax is hunkey-dorey, well, who am I to argue with such a learned man? Now, you just have to get it past the elected representatives. In the transcript, they distinguish between taxes and royalties. However, they have a tendancy, when talking about their overall tax rate, to throw in things like sales taxes and payroll taxes. That’s why I asked the specific questions on income taxes. I didn’t say it was hunkey-dorey, what I said was: (a) I don’t think that current gasoline prices are enough alone to trigger a recession; and (b) prices are far higher in many other countries and yet their economies have coped. …while the Republicans do all they can to destroy biofuels. They do? Nebraska, Iowa, and the parts of Illinois, Indiana, and Kansas where they grow corn are some of the most Republican parts of the country. Wanting biofuels to stand on their own is not the same as “destroying them.” I want my kids to be able to finish school and make it in the world on their own. That is not the same as wanting to “destroy” them. “Non-Metro Areas” means, essentially, rural areas. In short, the rural poor accounted for about 20% of the total poor population of the United States in 2008. Can you provide a list of countries that have done this? Many (most?) foreign governments utilize Production Sharing Agreements in which oil production is parceled out into a cost recovery stream and a profit sharing stream. There is no royalty payment in the sense of a percentage direct skim off the revenue. Royalty and income tax are two very different things. Royalty represents a direct deduction from the production revenue stream. Income tax is a tax on profit. If royalties, for example, are very high relative to price or production rates, the operator will still have to pay them and may as a result not make a profit. This is why I don’t believe the simple name change you claim is very likely: it’s not going to fool anyone. Even though royalty may not show up as a tax on US income, it is for all intents and purposes a tax nevertheless when federal leases are considered. Royalties are revenues that go to federal coffers. They’re pre-income taxes, if you will. So this charge of name changing seems odd to me. Couldn’t we accuse the US government of calling a particular form of tax a “royalty” and then accuse Big Oil of not paying enough income tax? That’s what lots of politicians are doing. There is no doubt some games have been played on what is a foreign tax and what is a royalty. A royalty can be deducted as a cost of doing business, and would reduce a tax bill maybe 25-30 percent. Categorized as an income tax, payments are 100 percent deductible. Foreign governments understand the U.S. tax code. To reduce costs for producers and attract business, foreign governments have agreed to call some royalties income taxes, allowing oil companies to take the 100 percent deduction. This practice has been sanctioned as far back as the 1950’s by the State Department and has been used by U.S.-based oil companies to reclassify the royalties charged by foreign governments as taxes. This document lists normal corporate income-tax rates around the world. Starting with Angola, normal corporate income tax is 35%, but income from oil is taxed at 50% (or 65.75% for foreign production-sharing agreements and joint-venture partners). In Bahrain the corporate income tax is 0%, but for oil companies it is 46%. In Benin, the rate on industrial companies is 25%, but between 33% and 45% for oil companies. The Sultanate of Brunei‘s normal rate of corporate income tax is 22%; for oil and gas companies it is 55%. Cambodia taxes income from oil or natural gas production-sharing contracts at 30%, compared with the normal rate of 20%. Egypt’s corporate income-tax rate is 20%, but 40.55% for comanies engaged in oil or natural-gas production. The corresponding rates in Oman are 12% and 55%. In Saudi Arabia, only foreign-owned corporations are subject to a corporate income tax, which is normally 20%. The corporate tax on natural-gas projects, however, ranges from 30% to 85%. The United Arab Emirates charge no corporate income-tax rate on most activities, but 50-55% on oil-company income. OK I stand corrected on this. But it seems hard to argue that, by being subjected to higher tax rates than other industries in many countries, the oil industry is getting a good deal because of a name change. A better deal, maybe. But whether the tax is coming before or after income, it’s still cash, and US oil companies operating overseas appear to be paying more than other industries. As Nutter explained in your referenced article, removing the FTC would amount to double taxation… for the oil industry only. Does the D-T tax table take into account payments made to host governments via the profit stream in production sharing contracts? Chilton is one of just five CFTC commissioners. Chilton was originally appointed to the Commodities Futures Trading Commission by Bush. He was re-appointed under Obama. He has been in government for 25 years and has long been an advocate of transparent markets and of market reform. His analysis of the market situation is based on many years of experience. And as a CFTC commissioner he is smack dab in the middle of what’s going on now in the markets. Other oil analysts have suggested that as much as a dollar ($1.00) is added to each gallon of gasoline through speculation. Yes, supply and demand are fundamental to the price of oil. We all know that. .Knowing this, however, does not stop speculators from adding an un-necessary surcharge or “greed tax” to every barrel of oil and thus to every gallon of gas. Forget about the 18 cents a gallon Federal gas tax you have to pay at the pump and think about the “Speculator Tax “ you must pay. Perhaps .65 cents or even $1.00 for each and every gallon of gas you buy. goes right into the pockets of an Oil Speculator. I was interviewed on a radio station about three weeks ago, and I told them that I thought oil was in a speculative bubble that would soon correct. They were asking about projections of $5 or $6 gasoline this summer, and I told them I didn’t think it would happen. It will happen eventually, but I thought a correction was inevitable. Well, if the evil speculators are truly pushing the price up, and that is making Americans to use less, is this actually a Bad Thing? They have been able to do something that the US gov has not been able to do in over a decade – raise gasoline taxes! Of course, the US gov’t isn’t getting any of the money, but that’s what you get for not taking advantage of a market opportunity – who knew someone else would tax gasoline instead? I think in the interests of the planet, there should be more speculation to raise the price even further – it even helps to make ethanol more competitive, and this, as we are always reminded is good for America. Now when Goldman Sachs says record levels of speculative trading, are they including themselves in that? if they are talking about all the “other” speculators then that is truly the pot calling the kettle black! If everyone, even the banks, wants to reduce speculation, then maybe it’s time to re-introduce Glass-Steagall and prohibit the banks from trading for themselves. That should have been a condition of the bailout. I would like to see the CFTC require Goldman, Merrill, etc to reveal how much oil trading they have been doing for their own account – I think that might reveal who the biggest speculators are. But whether the tax is coming before or after income, it’s still cash, and US oil companies operating overseas appear to be paying more than other industries. Indeed. As claimed by the Environmental Law Institute (ELI) in its analysis of two years ago, Estimating U.S. Government Subsidies to Energy Sources: 2002-2008, this shift from royalties to special income taxes was encouraged by U.S. authorities in the 1950s in order to enable oil-producing countries to increase their tax take while having an overall neutral effect on the bottom line of the oil majors — who, it seems, went along with the plan. The ELI estimated the value of this tax feature, which they considered to be a tax expenditure, at around $2.2 billion a year. As Nutter explained in your referenced article, removing the FTC would amount to double taxation … for the oil industry only. And I agree with him. It would be unfair to single out any industry for complete elimination of the foreign tax credit. Indeed, the FTC is a normal feature to avoid double taxation. Even the ELI recognized this in their estimation of oil-industry subsidies. What they measured was what revenues the U.S. Government would have collected had the income tax paid on top of the normal rate been classified as a royalty payment instead. The problem with reforming such a tax “loophole” (if one wants to call it that) is that the tax systems of the oil-producing countries have evolved with this feature of the U.S. (and other countries’) tax systems in mind. That is to say, if oil companies had not been able to treat these foreign income taxes as income taxes, the oil-producing companies might have charged lower royalties. Hence to treat the excess foreign income tax on oil companies as a royalty now would mean an immediate increase in the tax burden on oil companies with overseas operations. The IRS also has the potential to end this practice through rules governing “dual-capacity taxpayers.” The IRS recognizes that certain foreign “levies” or portions of such levies are not taxes, but rather are imposed as compensation for the sale of “specific economic benefits” (e.g., royalty payments for government-owned oil and gas). Oil companies subject to a levy that is both a form of general taxation and a fee or charge for a specific economic benefit are known as “dual capacity taxpayers.” However, the IRS and U.S. courts have interpreted the rules governing these entities in such a way that it is still possible for oil companies to take advantage of the credit in ways that greatly exceed generally applicable foreign corporate income tax rates. I haven’t looked into the details of the Close Big Oil Tax Loopholes Act to see whether it goes beyond this recommendation. Certainly I know that the IRS has recently tightened up its taxation of foreign taxes levied on individuals heretofore accepted as “income tax” and therefore eligible for a foreign tax credit. This has led to much higher U.S. tax bills for U.S. residents of France, for example, who pay a surcharge on their income tax to the French authorities (Contribution pour le Remboursement de la Dette Sociale) that the IRS now no longer allows to be classified as “income tax”. Determining the percent of income attributable to US operations is a fertile area for creative accounting to reduce a multinational corporation’s tax burden. Operating expenses can disproportionately be attributed to the country with the highest tax rate. If US tax rates increase, the company can’t move its markets. The customers and revenue is still US based. But there will be increasing pressure on their accountants to make paper transfers of income to more tax friendly countries. Nobody really knows what the Laffer Curve looks like except at the two end tax rates, zero and 100%. Tax revenues are actually a lot more sensitive to changes in the price of energy than tax rates. Tax cuts worked pretty well for Reagan, when oil prices were going down. Tax increases produced a balanced budget for Bill Clinton, when oil prices continued to go down. Tax cuts didn’t work so well for GW Bush, when oil prices were increasing. Tax revenues decreased in relation to population growth times inflation. A lot of Republicans in my state of California think that we could magically erase the state’s $25 billion deficit by reducing taxes. their taxes would increase by $1 billion, or an additional 3% of their 2010 profits. This is hardlly confiscatory. Thanks for the information – I learned a lot on taxation. I suppose the bottom line is your comment on industry evolution under a given tax regime. Assuming the regime is designed to achieve certain investment goals, it really seems odd, in estimating the regime’s “subsidy cost”, to then try to change the regime and assume that it would have no impact on investment. But fairness doesn’t seem to be the issue here; it seems more about punishment and the appearance of “doing something,” no matter how counter-productive it might turn out to be.